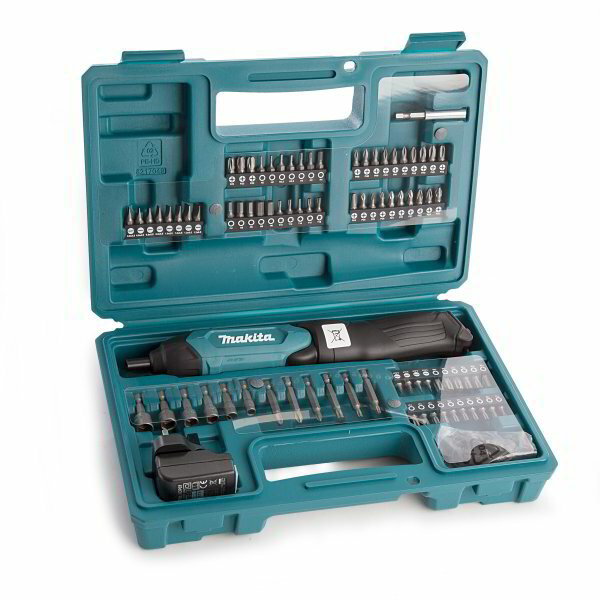 The Makita DF001DW 3.6V Cordless Screwdriver is a lightweight and cost-effective in-line cordless screwdriver. It is designed to fit the needs of repair technicians and is ideal for kitchen installation and building furniture works and other tasks at hand. It is powered by 3.6V/1.5Ah built-in Li-ion battery which can be charged through a micro USB connector port and the bottom of the grip. The Makita DF001DW 3.6V Cordless Screwdriver can be used both in pistol style and straight style. It comes with amazing features including built-in rechargable battery, 81 pcs assortment, bright LED joblight, forward and reverse switch, and a battery protection circuit that protect the device against over-heating and over-discharging.